I gnash my environmentally-correct teeth when I see how what used to be called "coal" has now rebranded itself as "clean coal." As this article in Slate points out, there ain't no such thing. The rebranding of coal, however, has got me thinking about why different political parties favor certain types of energy. There are some ways of getting the energy we need that involve converting stuff to energy--stuff like coal, oil, natural gas, grain, and (to a lesser extent) uranium. Extracting, processing and selling that stuff is a very profitable and big business. Naturally, this energy options are favored by the party of big business. There are also ways of getting energy that don't require the selling of stuff. These non-stuff sources include solar, geothermal, tidal, wind, and hydroelectric. Sure, there are big initial investments, as there are with any energy infrastructure. But once you've got your solar panels up and your windmill turning, you don't have to keep buying stuff to get energy out. Then there is no business for ExxonMobil, BP, etc. This is not an especially deep or original insight, but it's still good to keep in mind as we make energy policy. Our energy mix twenty years from now is going to be quite different from what it is today--at least, I hope so (because if it's not, we're doomed). Both major party Presidential candidates are talking up this issue. But when it's time to cut deals, write funding lines, create programs, give tax breaks and otherwise use the power of the government to influence our energy future, it's a good idea to remember that we can have an energy future that doesn't involve the consumption of so much stuff. That kind of future, however, is not at all what Big Energy wants, and they will fight to block it. What's more, because there isn't a massive and continuous revenue stream to be gained from non-stuff energy sources, it's less likely that our richest and strongest corporations will push for them. If you were the CEO of ExxonMobil, for example, would you invest in plants that make the equipment needed to harness the wind, solar, tidal, and geothermal energy, knowing that once your customers bought it, they wouldn't need you anymore? Or would you invest in "clean coal" and biofuels, both of which you can keep selling to consumers for years and years? Capitalist self-interest, in other words, is not going to take us into the kind of non-stuff energy future we could--and should--have. It's going to be up to the government to change the economics of energy production, maybe by taxing stuff-energy and giving tax breaks for non-stuff energy. I can hear the oil companies screaming now. Get ready for another economic shock of major proportions — a virtual doubling of prices at the gas pump to as much as $10 a gallon. That's the message from a couple of analytical energy industry trackers, both of whom, based on the surging oil prices, see considerably more pain at the pump than most drivers realize. Because if it does, the social order in this country will all but collapse. I'm serious. We built an entire nation on the idea that we would be able to drive from place to place. Yes, there are places where one can live fairly will without a car, but not many. Our leaders have been dithering since the mid-70's about energy policy and doing essentially squat. People who warned of energy shortages and price spikes were written off as Cassandras, tree-huggers or windmill kooks. And now the bill for our national profligacy is coming due. If payment is demanded all at once--$10 a gallon!--there will be riots in the streets. As well there should be. 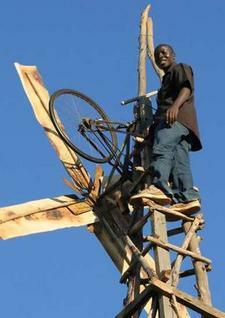 Just when I was starting to feel overcome by cynicism and disgusted with my own ironic self, I discover something wonderful like William Kamkwamba's Malawi Windmill Blog. Like they say, read the whole thing--and then just try to tell me that one person can't make a difference. When I began contributing reviews and op-eds to newspapers, it was a revelation to me that the people who write the articles are not the people who write the headlines. I understand the papers' desire for stylistic consistency and for a good overall mix of headline types. The risk, however, is that a headline comes out that is not accurately reflective of the article. Then one wonders: is this simply due to sloppiness on the part of the headline editor, or is it an attempt to advance the paper's editorial agenda? Building thousands of wind turbines would probably not reduce the pollutants that cause smog and acid rain, but it would slow the growth in emissions of heat-trapping gases, according to a study released Thursday by the National Academy of Sciences. The headline is technically right: slowing the growth of emissions is not the same as lowering emissions. Nevertheless, it's misleading--or at the very least ambiguous--on two counts: it strongly implies that wind turbines would not have any effect on air pollution at all, and it sets up the confusing and inaccurate distinction between "pollutants" and "emissions" which is developed in the lede. I attempted to compare the New York Times summary of the National Academy of Sciences' report in an attempt to determine whether this distortion originated in the Times or the NAS. I wasn't able to do so, because the NAS charges for a download of the full report. Grrr . . . haven't we taxpayers already paid for this material? If the mission of the NAS, as headlined on its website, is to be "advisers to the nation on science, engineering and medicine," then surely they ought to make their advice freely available. At any rate, I'm suspicious about whether an institution that relies significantly on oil industry advertising is playing it straight on this issue. Of course, given the way the Bush administration has politicized scientific research at all levels of government, I'm also suspicious about whether the NAS and the "Executive Office of the President, Council on Environmental Quality" (which "supported" the NAS report) can be considered an unbiased source of scientific evaluation.